It’s my first time on a game drive in the South African bush. I’ve spent the night in a palatial lodge on a ridge overlooking the breathtaking Waterberg mountain range, and, long before dawn, I’ve set out on a perilous three-hour Land Rover drive down into a vast gorge and up into a Big Five game reserve. At the fence, with its iconic ‘Beware lions’ sign, I dig around in my bag for my mobile phone so I can take a picture. It’s not there. Somewhere in 16,000 acres of wilderness, my mobile lies among the rocks. ‘That’s it,’ I think. ‘Bye-bye, phone.’ Our ranger, François, has other ideas. Undeterred, he immediately swings around and we set off the way we came. Twenty minutes later, he spots my phone stuck between two rocks at the top of an acute descent, and casually hands it back to me. ‘We always find people’s things it’s a private reserve,’ he says, effortlessly proving his ranger credentials. This episode was just one of many examples of the unbeatable service and passion for wildlife that characterises those involved in a new property project aiming to encourage wildlife enthusiasts to invest in the Water-berg, and, if they so choose, get involved with the work. We were driving between Dinkweng and Ka’Ingo, a safari park and a game reserve built around wildlife conservation and owned by the Zorgvliet private residence club. Their properties are a three-hour drive, or just over an hour in a light aircraft, from Johannesburg and form part of the UNESCO Waterberg biosphere. Dinkweng is a family-friendly property fenced off from the Big Five (but still with great wildlife), and Ka’Ingo is the larger reserve, home to the holy quintet of lion, rhino, elephant, leopard and buffalo, among others. Dinkweng, where we stayed on the first night, has a dozen 280sq m lodges in breathtaking locations, each with three en-suite master bedrooms, open-plan living rooms, and double-height cathedral ceilings. Kitchens are spacious, with fridges that are fully stocked before you arrive. Outside are jaw-dropping views of the mountains from large sun terraces and plunge pools where cheetahs are known to stop by for a drink. Each lodge is set on its own private plot along the main track into the central lodge, where guests and staff eat together and which also houses the meeting place for game drives, the swimming pool and the spa. Fractions are available to buy from £8,000 for a week’s use a year; buyers can purchase as many fractions as they please, and there will be 40 in total for each lodge. Owners also receive discounts on game drives, spa treatments, complimentary wine tastings and 15% off airport transfers, plus wine at cellar prices from Zorgvliet’s estate near Cape Town; fractions are also transferable with Interval International, which has a network of more than 2,400 resorts in more than 75 countries. The second Zorgvliet property is Ka’Ingo part of a 16,000-acre Big Five game reserve. There are 12 luxury lodges within the main resort, which houses pretty gardens, a spa and a swimming pool, plus the main dining area, which is under cover but open to the elements, and a wonderful circular dining area, or boma, built around a huge fire where food is cooked under the stars. Property here can’t be sold because of the land-use rules, but weeks are available on a vacation-ownership basis from £6,000 as part of a mixed-use policy to get enthusiastic guests involved in the overall plan, the aim of which is rebuilding and rehoming Africa’s wildlife. Ka’Ingo and Dinkweng are opening up these opportunities to would-be property owners as a means to continue their conservation work. 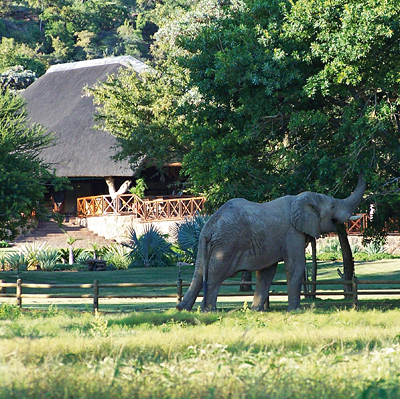 The team, headed up by owner Mac van der Merwe, who purchased the land seven years ago, and his general manager, Nick Callichy, has worked hard to develop the most natural environment possible for the animals by introducing indigenous wildlife originally found here when the settlers arrived in the 1800s. They’re currently running programmes with endangered species, including cheetahs, leopards, buffalos and white rhinos, as well as preserving their rock-art sites, which are evidence of some of the first encounters between man and beast thousands of years ago. Improving the environment for wildlife also means opening up boundaries last July, Ka’Ingo brought down the fences between its land and a neighbouring private reserve to include the six-mile Mokolo River corridor, previously off bounds to the game. This is also the site of the impressive River Lodge, which, when complete, will consist of five five-star properties integrated into the reserve, with a terrace overlooking the river for outside dining, swimming pool and their own boma. ‘Having breakfast on the terrace as the elephants bathe in the river is going to be one of the most incredible experiences on the reserve,’ explains Mr Callichy. Zorgvliet is offering something that isn’t available on your average safari experience. These properties exist as part of a passionate undertaking to return this part of Africa to some of its previous beauty and grandeur; being a part of it is means giving some-thing back to an internationally recognised biosphere, which represents a crucial part of the continent’s heritage.